Art Gems thanks John Grant of The Harbour Group at RBC Dominion Securities Inc. for generously committing to a matching gift equivalent to the hammer price of this lot, up to a maximum of $2,000. Alex McLeod is a new media visual artist from Toronto. His images recall the wide-open vistas of romantic landscape painting and strange otherworldly dystopias. 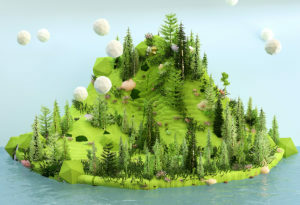 Works, such as Art Gems’Green Island, feature a unique formal marriage between innovative digital technologies and a distinctly Canadian matrix of idolized landscapes. The work subsumes national art traditions and renders monumental landscapes in new media dimensions. Metrolinx recently commissioned McLeod to create the largest digitally printed image in the world – a work that will run the 1.4-kilometre length of a new raised guideway in Toronto. His art can be found in the collections of New York’s Whitney Museum of American Art, the Museum of Contemporary Canadian Art, Royal Bank of Canada, TD Bank, and BMO Financial Group. A 35-foot digital mural is currently on display at the Drake Commissary. McLeod has exhibited throughout Canada and the US, and abroad in the UK, Spain, New Zealand, Brazil and Japan. He is represented by Galerie Division in Montreal and Toronto.